Due to a lack of organization, time, or design ideas, many homes lose functionality in their spare rooms. 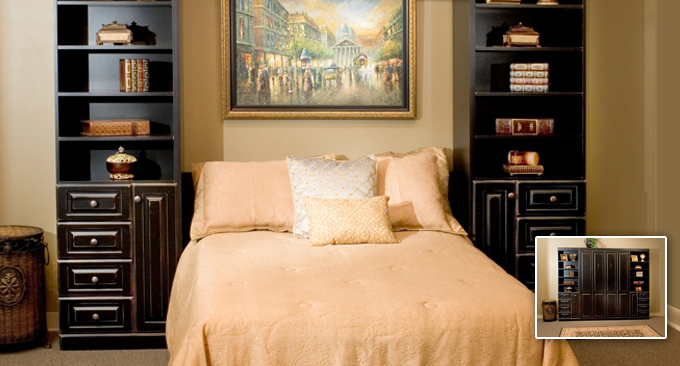 For example, if you frequently host friends and family, creating an elegant guest room is a wise use of space. However, the pressures to maintain a guest room all year round often renders it useless for anything else. 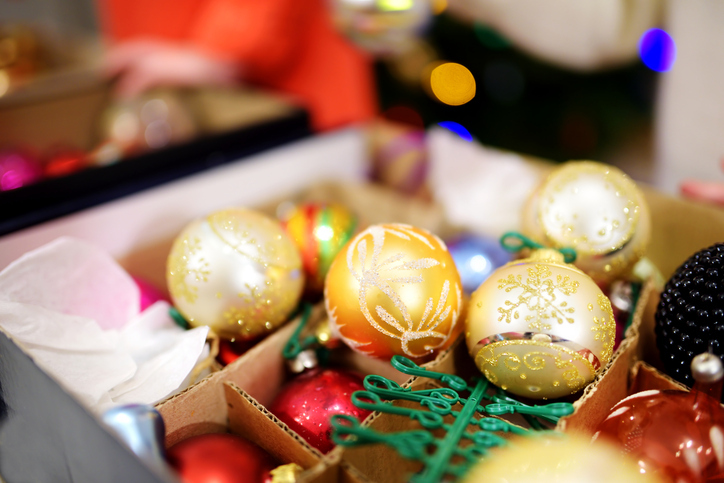 On the other hand, homes that use their spare rooms as an office or storage area find that it becomes the Bermuda Triangle for any item set inside it. In both of these common scenarios, a spare room is only designed and used for one purpose. More Space Place is here to change that with custom-designed furniture and Murphy beds. Murphy beds, also known as wall beds, are built with a patented system that easily reveals a bed when you have guests and hides it away when you need the extra space. More Space Place is the #1 retailer for Murphy beds in America with multiple designs and customization options to fit your home perfectly. Call us for a free in-home estimate and we can begin designing an organized and efficient room for your lifestyle and needs. Read on for ways to maximize your spare room. In order to make the most out of your spare room, constructing a system is essential. We can build cabinets and furniture for you whether you need more closet space for seasonal items, an office to embrace the telecommuter trend, or if you want to dedicate your spare room for relaxation. Our organizational experts know how to maximize a space’s potential. With stylish finishes and designs catered to your needs, your spare room will no longer be a glorified junk drawer and instead be an easy-to-use, beautiful, and comfortable space. 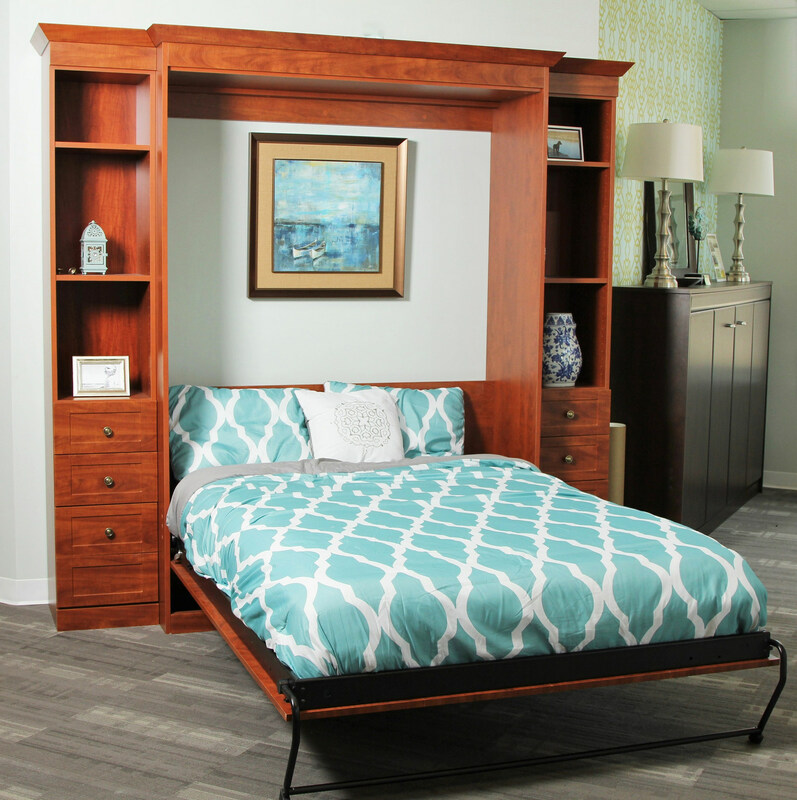 The beauty of a Murphy bed is that you can create a place for everything, without sacrificing a guest room. Our custom Murphy bed units can be built with storage cabinets and drawers, sliding bookshelf doors, and even fully functional home offices. When you need to use the bed, simply clear the floor space and pull the mattress down. With elegant closets and drawers to store your everyday items, it will look less like a spare room and more like a hotel room. Some buyers have misguided concerns about Murphy beds and comfort. The reality is, we can custom fit your unit to hold the mattress of your choice! There is no folding necessary like there is with a futon. 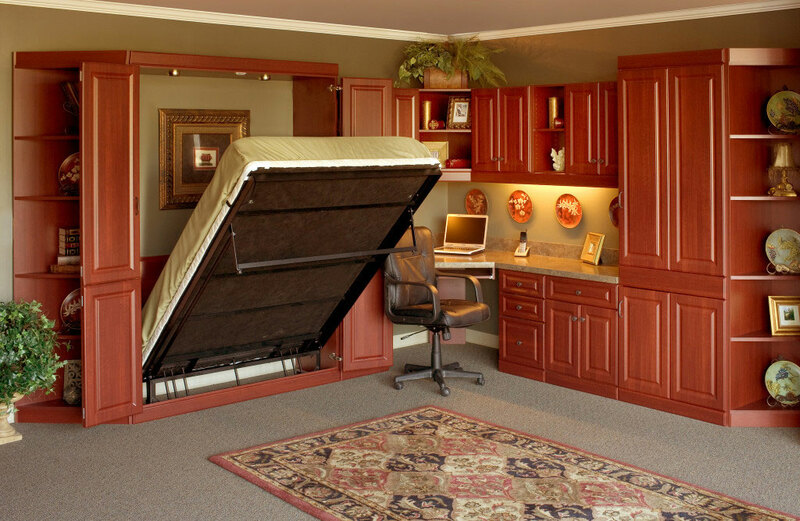 In addition, Murphy bed mattresses are often thicker than traditional rollaway beds or futon cushions. From twins to kings, we can build a room that is comfortable for your guests and beneficial for you. To get inspiration, take a look at some of our popular designs and consider what you need most out of your spare room. The Cosmopolitan panel bed, desk bed, and Chesterfield bed-over-sofa panel bed are great options to make the most of tiny spaces. Depending on the size of your room, the height of your ceilings, and other functions you’re looking for, we have a Murphy bed for you. We believe that a spare room should be easy to use and enjoy. Start making room for life and contact us to get a free in-home consultation and estimate.